There are some really modern choices available in the beach metal detector category. Advancements in technology have a lot to do with brands getting better at making waterproof metal detectors. But it also has to do with Garrett’s continued push with the starter packs and equipping customers with all the tools they need to dig in the sand or water. They aren’t the only company with something to prove, as this continues to be a great category to innovate with metal detectors. With this high priced starter pack you’ll never need to purchase another set again. Garrett went all out by giving users everything they need in one box, and this is truly a one of a kind purchase. The metal detector at the center of this kit is the Garrett AT Pro and its 8.5×11 search coil. It’s one of the better selling models in their lineup and the one that gets has the most kits made from it. With the all-terrain versatility of this unit, you won’t get sidetracked with bad targets even when there is a lot of trash around. When you get past the base of the kit, there is a ton of stuff included. 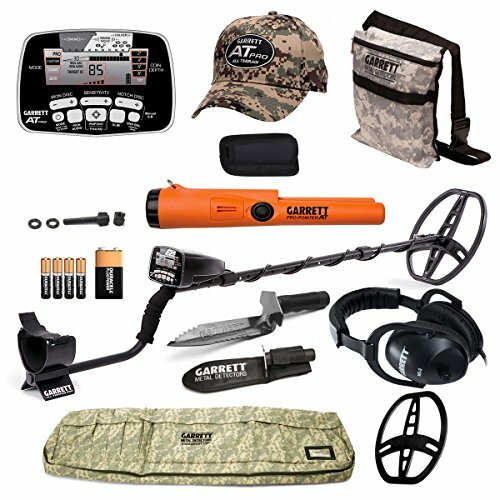 You’ll get a Pro Pointer AT waterproof pinpointer, coil cover, Garrett Mastersound headphones, diggers pouch, edge digger, camouflage soft case and a fresh set of batteries. All of the accessories mentioned are high quality so should last a really long time from purchase. The AT Pro is capable of an incredible 15 kHz frequency, one of the highest in the industry. And the informative LCD screen uses a Graphic Target Analyzer to find specific targets. This a top three starter pack from Garrett that will guarantee customer satisfaction. The WhitesTreasurePro is a strong candidate for best metal detector in its class thanks to the modern features. It is high priced but earns that by being completely customizable on the software and hardware side. Stem length is adjustable from 46 to 56 inches, and is a strong material that is built to last. Power is managed with two AA batteries, capable of up to twenty hours of continuous use. While that is considered low compared to other products, buyers should take into account how well the extra control panel features work. When comparing control panels with other top tier products, the Whites TreasurePro remains ahead of its time. There are multiple discrimination features built around the cleanest interface created. Even beginners can grasp the basics of the controls within a few minutes, and it’s thanks to the panel design. Audio is king on this model, and there are eight audio tones to choose from to discern important targets. Frequency is 7.8 kHz from the 10 inch coil, so when you use it with the included Bullseye II pinpointer, there is nothing that you can’t find. Consumers of all levels will get good value from this metal detector and fall in love with features. The high priced Ace 400 has been kind to Garrett and is still one of their hot items. After bundling it up in a new starter set, the company is once again showing off their expertise of strong metal detectors combined with useful accessories. The Ace 400 has an 8.5×11 search coil designed to be useful on multiple different types of terrain, even the beach. You can submerse the coil without doing any harm to the actual unit. Even if something does go wrong, there is a two year warranty attached on the base parts. Where things get interesting for this model is with all of the goodies; a search coil cover, Garrett AT Pro-Pointer (waterproof), ClearSound Headphones, Ace Environmental Cover up for the control box, batteries and an adjustable arm strap. The most interesting accessory on the list is the waterproof pinpointer. It is much more useful than the default pinpointer included in other starter sets, and you’ll be less worried using it around water. With the power of the Ace 400, you’ll have features like multiple audio tones and five search modes to guide you on the hunt. This is a good alternative starter package for buyers that are interested in fully waterproof materials. Smaller is better, or at least that is the thought process behind the marketing of the Quick Draw II. 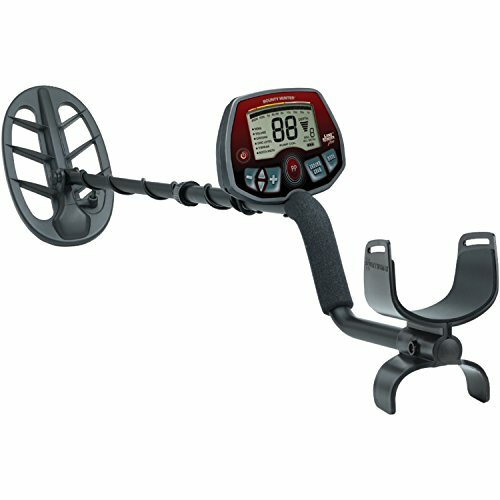 It is an average priced metal detector starter kit that tries to squeeze a lot of features into a much smaller package. They started by automating a lot of the most important features like ground sensitivity. Even though a lot of the important features are automated, they still don’t draw a lot of power. The result is less false signals and more accuracy by default by eliminating common user error. Buttons were cut down on the slimmed down interface, and they went with a traditional look containing knobs and a small information screen. One touch controls are located below the screen, so useful core features like depth sensitivity can be changed in a single button press. The eight inch coil is waterproof and interchangeable, so there are plenty of options for personalizing the experience. Two 9 volt batteries are required to operate, and they last for ages since a lot of the extra fat was cut from the draw power. Extras bundled with the unit are a basic pinpointer and a metal detector carrying bag. Only a few seconds are needed to pack everything up, and once in, it’s incredibly light. Slim but effective works well for the Quick Draw II, a metal detector that saves space without compromising usefulness. Fans of the F22 will fall in love with the massive improvements of the high priced F75. 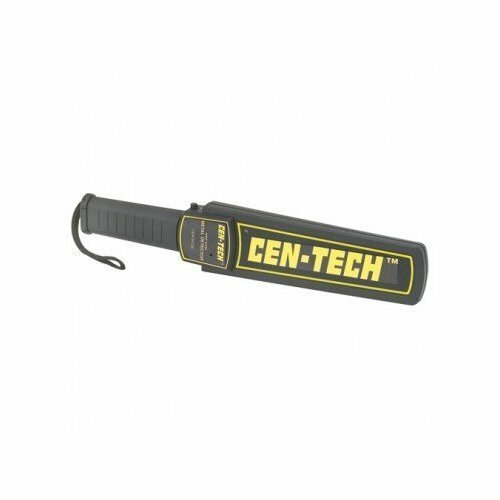 It is a key flagship product from the Fisher brand, and is still the lightest metal detector in the industry. That leads to less strain on users that handle devices for several hours a day. The default color of black and gold will thrill some sports fans but is still an appropriate enough design for daily use. With its beautiful LCD screen, you won’t notice much else about the design. A 0-99 numeric target identification is standard, but slightly beefed up on this version when setting targets. There isn’t a lot that this metal detector can’t find once you set it up correctly. Using a double filter discrimination mode, trashy areas become a cakewalk with the right filters. And since you can search in wet areas using the double-d waterproof coil, there really won’t be any place that is off limits. You’ll get forty hours using four AA batteries, and there is a possibility to use generic sets and still match that run time. Single transmission technology cuts down on the power draw from the 11 inch bi-axial coil, so even in high power mode it still uses less power than other metal detectors. Whether you’re a fan of their old models or not, the F75 is still a groundbreaking product to sink your money into. Another starter pack from Garret comes along at the usual high price, but this time it has some special extras added in. The AT Pro Digger’s Special equips users with the best tools for finding buried objects. 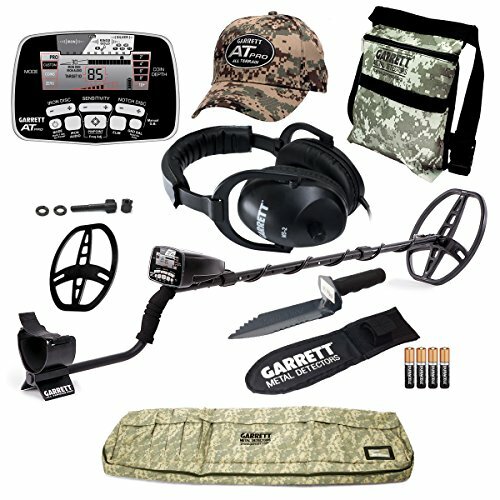 Inside the package is an edge digger with sheath, AT Pro Cap, batteries, premium headphones and a digital camo soft case. Standouts in the accessories mentioned are the headphones since they take full advantage of the metal detector’s advanced audio. Sound is clear even when there is a lot of noise happening in the immediate area. To protect the search coil, they also included a cover for when you’re storing or transporting it. Everything about the camo look with the accessories looks great, but the metal detector itself uses a regular black color for its design. The control panel is modern, with a large LCD and several buttons to adjust the settings. Customization is high if you want to match modes for a specific target, even if it is a little deep in the ground. About the only thing missing from this set is a dedicated pinpointer, but the accuracy is so spot on that most users will be fine without it. Garrett’s Digger’s Special is an interesting buy if you like the camo look and more than worthy of a recommendation. Minelab and the X-Terra 705 is a combination that has brought the company a lot of popularity. This specific model was created with the idea that it would be the best choice when looking for gold. 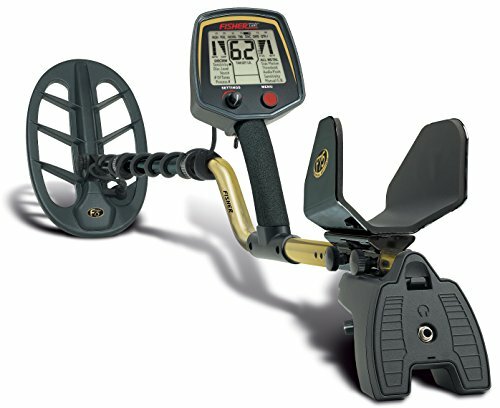 It’s a high priced modern metal detector with a lot of special care beyond the core abilities. With the proprietary True Digital VFLEX technology, their single frequency metal detectors can seamlessly change coils to fit their intended preference. It was a game changer when introduced, and allowed Minelabs to market seven different coils based on their frequency. With this feature you’re equipped to find anything, anywhere. The extra coils are competitively priced so that you can choose the best ones for the job. Filtering options on the large LCD is plentiful, with manual ground balance playing a big role in the success of finding materials. Adjustments go from 1 to 90, more than enough for even professional users. Tracking settings are grouped neatly within the menu, and there is even a specific setting for beach. Pinpoint modes are grouped into auto and sizing, with the latter collecting and showing valuable information like size and shape of the target. There aren’t a lot of metal detectors that can match the X-Terra 705, which still continues to be in a league of its own. Beach metal detector users have great success using the AT Pro Metal Detector Bonus Pack. Although it is one of the highest priced starter sets on the list, it still manages to offer something a little different than the other starter packs. New in this set is the inclusion of a camo backpack, and on further inspection it seems to be just as durable as any other outdoor backpack. This is important since there are so many different extras that come with the set. 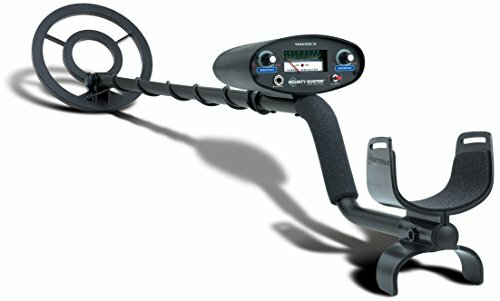 The AT Pro is a strong metal detector, using an 8.5×11 submersible coil to find objects on land or in the water. But as usual, the star of the show turns out to be the accessories. Within the package is a Propointer AT, batteries, camo diggers pouch, AT Pro camo cap and a holster for the propointer. All of those gadgets fit neatly in the provided camo pack with room for more extras if you want to add them. Headphones and a coil cover also come with this set, so the only thing that you’ll be missing out on is a multi-function shovel. When submersing underwater, the coil is rated at a maximum of 10 feet. Buyers of this starter kit will get a great deal that is sure to find them a lot of precious metals. Minelab shows up again, this time with their Go-Find 60 detector starter set. This high priced metal detector has the most unique look on the list. Even the accessories are a little different than what the competitors offer, as Minelab looked to separate themselves from the pack. Extras that come loaded with the base are batteries, earbuds, a smartphone holder, digging trowel and a carrying pouch. The two unique items from the list are the earbuds and smartphone holder. The earbuds are quite good, using a standard 3.5 connection so that they are also compatible with plenty of other devices. The smartphone holder takes into account that phones are now larger, so it is compatible with a lot of current devices on the market. As for the metal detector, it uses a 7.8 kHz coil with built in pinpoint tracking. Several modes are available, including a sensitivity adjustment that spans five levels. Most of the complicated settings are handled automatically since they enhance the massive amount of customization options. The LCD is one of the most advanced available, using a clean look that mimics current high end electronics. But the star of the features is the sneaky addition of Bluetooth functionality. It isn’t advertised as much, but this is considered the hardest to find feature on any metal detector. For what it can handle, the Go-Find 60 did a good job, or at the very least set a standard that everyone else should follow. This is an incredible deal that shouldn’t be passed up by consumers or professionals. 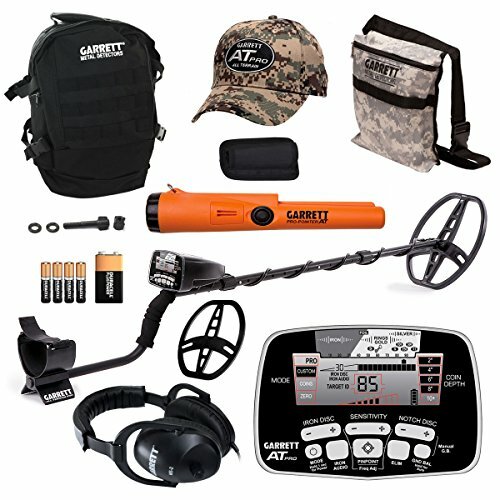 Garrett has strong products, but the brand that stole the show was Minelab. In both instances they provided cutting edge metal detectors that were perfect for beach use. Their prices were high, but so was a lot of the competition. Both of their products contained features that none of the competitors had implemented, so in several ways Minelab caters to a specific audience. The Fisher F75 was also a top pick for beach use, as the company regularly shows up on top lists across the world. A couple of years ago the beach category for metal detectors was still developing. Now, there are more waterproof metal detectors than ever before. They are also the most versatile types since they are beneficial for use on land or in the water. What Should You Look For In A Beach Metal Detector? A good beach metal detector is easy to spot if you prioritize a few key features. Some of the extras are really helpful and shouldn’t be ignored. Water Depth – How deep can it go? Just like regular waterproof metal detectors, the lower the depth the more valuable it is to the customer. There is no point in purchasing a device that is rated less than the depth you want to achieve. Long Lasting Batteries – Some of the best treasure was left in the water because the battery was too weak to go on. You’re going to run through a lot of settings while on the beach, as you switch from one targeting mode to another. Batteries should last a long time or the metal detector should have a backup option. Trowel/Digger – This handy little tool is perfect for the sand and wet areas. It is small enough to fit in a pouch but strong enough to penetrate anywhere on the beach that you need to dig. A valuable feature is if the trowel/digger folds for travel use or comes with a sheath/bag. Interface – You’re going to run across a lot of strange objects on the beach. Having a control panel with multiple options and an informative interface is a must. A good example of the type of interface that works the best comes from the Minelab X-Terra 705. With the pinpoint feature, shapes and sizes of targets are visible on the screen when needed. Beach metal detectors keep getting better as the technology improves for water based areas. With current products, finding metals on the beach is no different than any other area. Metal detectors are capable of finding valuable metals on all types of terrain. But what happens when you introduce them to a wet surface? That is when waterproof metal detectors earn their value, with many of them able to be fully submersed. This completely opens up the way most users search for valuables and introduces them to a lot of new features. There is a lot of competition in this category, with brands delivering where it matters the most. 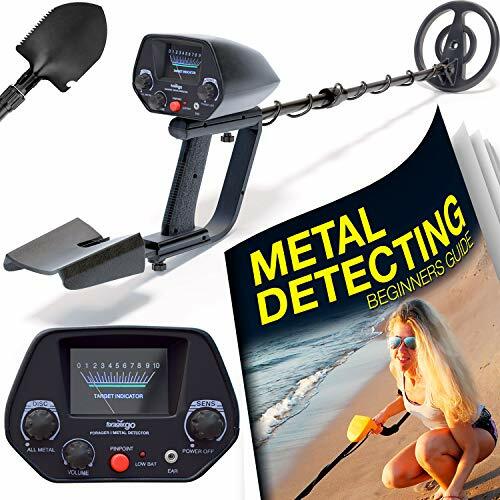 This low priced NHI metal detector starter kit is marketed towards beginners that want to learn the ins and outs of the craft. It has a lot of comfort features so that you can use it for hours without strain. But the star of the show is the thick beginners guide book that comes in the package. This is the best introduction to metal detector use on the market, and although it is made for kids/juniors, adults can still get a lot of use out of the set. With a two year warranty attached, this is a great deal for all ages. The waterproof coil detects all metals, even gold nuggets. You can eliminate unwanted targets using the discrimination function. Since the set comes with a multi-function folding shovel and pinpointer, there is a higher chance of you finding the correct materials rather than wasting time on incorrect objects. Batteries last a long time, with the hard to miss low battery indicator always in plain view when needed. Going into deeper waters isn’t a problem since the stem is waterproof, something that is considered a major feature for a metal detector this low priced. As a package, this starter kit from NHI comes highly recommended for daily use. The Tracker IV is available as a base unit or as a starter set. Base unit pricing makes the TK4 one of the lowest metal detectors in the waterproof category, while the starter set puts it at an average price. Key features for the base model is the two tone audio and ruggedness of the metal construction. It was built for tough environments so will be able to take a lot more punishment than competitor products. Other useful modes are the all-metal and discrimination mode, with the latter reaching its full usefulness when paired with the superior ground balance. 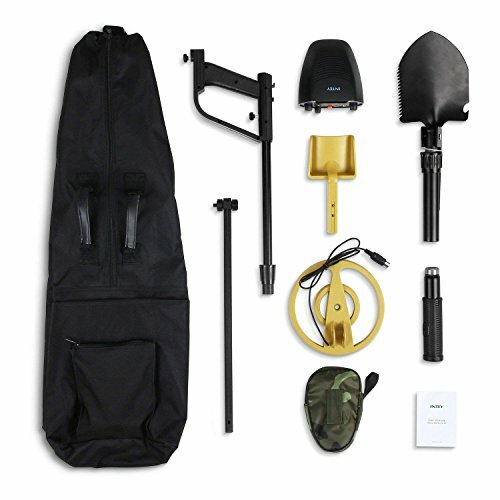 Buyers that opt to purchase the starter kit get the base metal detector plus headphones, a carrying bag, pinpointer and pouch/trowel combo kit. The headphones are the big surprise of it all since Bounty Hunter chose to go with their more popular Head-PL models. They are padded and comfortable, and completely compatible with all Bounty Hunter metal detectors that aren’t in the junior family. In fact, the headphones make the package a lot more attractive if you want to use it in headphones only mode. Either version of the Tracker IV is a winner since the price is so accommodating to customers. Another low priced metal detector that is worth investing in is this starter set from INTEY. The all metal mode is high powered enough to make it viable for any terrain. This also applies to beach and shallow water hunting by using the waterproof stem with adjustable coil. Discrimination mode comes with multiple features that makes prioritizing a target much easier. Iron, zinc/1 cent, coppers and pull rings are all part of the setup when discriminating metals. The pinpointer feature is helpful when used with the disc option, and should save you time when targeting objects that are deep in the ground or water. Since the stem is adjustable, you can have it match your height or extend it to reach lower in the water. Extras bundled with the kit include a carrying bag, multi-function folding shovel and a complete user guide. A hidden specialty of this model is how it handles batteries with the backup feature. One 9 volt battery is needed to start operations, but there is a slot for a second one to serve as a backup when the first one fails. Consumers can depend on this feature so that they are never in a bad position while searching for objects. Although a lot of the features of this starter kit can be found in other models, the price and intelligent battery usage makes it worth a buy. Goplus specializes in low priced metal detectors that incorporates several mid to high tier features. The MD-4030 is their best waterproof model, and also the most recommended metal detector in its price class. Build quality is solid, using a steel frame with pp handle to comfort the user without compromising the durability of the device. Everything is powered by two 9 volt batteries, using a max of only 70 mA when at full power. The standby power usage of 10 mA is a big deal by letting users keep the same battery for months without needing to swap out. A lot of that has to do with the low frequency, but it is still an impressive feat for a waterproof metal detector. The control panel is traditional, meaning it is two knobs, a button and a meter. This is as simplistic as you can get, so it gains a lot of favoritism from beginners. Experienced users that are nostalgic about the old metal detector interfaces will also find it to be pleasing to the eye, or at the very least the closest modern equivalent to the older devices. Operational modes are listed as all metal and disc, so the basic two modes on all metal detectors. There is a headphone jack that outputs simple tones when near a target, so good headphones are recommended. Sometimes simple is better, and that is why the MD-4030 is a great low power metal detector for all users. Zaap is an interesting company that is in direct competition with Goplus. They are also part of the low cost metal detector movement, and have produced several notable models. This particular device borrows heavily from their past successes, starting with the much loved two tone audio mode. It pairs well with the 3.5 earphone jack if you use quality headphones. The jack is worth mentioning since a few brands in the industry have gone to proprietary headphone options. ZAAP makes it easier for the average customer to attach a great pair of headphones to their metal detector while searching in noisy areas. Both freshwater and saltwater are supported by the 8 inch waterproof search coil. That is a surprising inclusion when you consider the low price of this product and compare it to the competition with similar features. The entire coil and stem is weather resistant, and both the stem and discrimination modes have multiple adjustment settings. Zaap went with a meter and two knobs for their control panel, but also added additional buttons at the bottom to support light customization options with the search- once again, surprising in its price category. 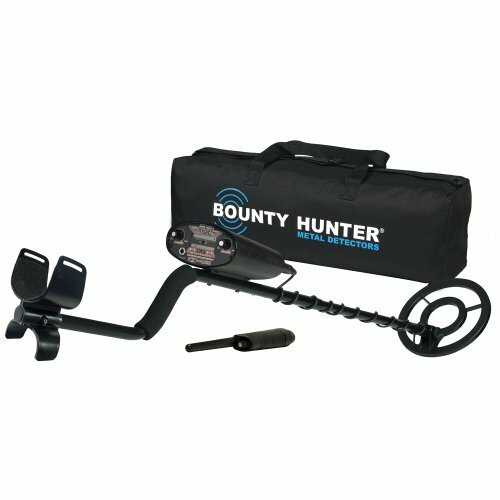 Buyers are getting a great value with this metal detector, which is one of the better buys in the entire industry. The dependable waterproof coil of the Ace 200 is exactly what you need when searching water is an option. It is 6.5×9, so more than enough to cover land or water areas. The Ace 200 starter kit is a mid to high price choice that comes with a lot of useful extras. While using the Garrett Treasure Sound headphones you’ll notice it gives clear tones in noisy areas. They are comfortable to wear for extended periods of time, while also being useful as stereo headphones. Currently these are the second best pair of headphones from the Garrett brand. The instruction manual is full of useful information for all levels of users, with the company making it a point to prioritize the usefulness of the light weight and waterproof coil. Four AA batteries are included and should last a couple of months without needing to be changed. They are branded, but it is the low power consumption of the Ace 200 that makes them last so long. As long as you stick to branded batteries when replacing the originals, you can expect similar performance. 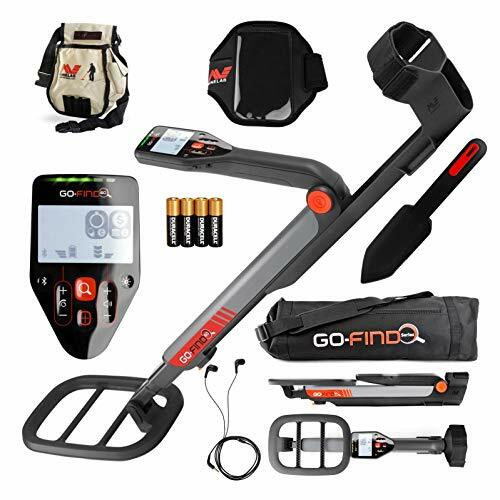 This starter set does a good job of being a reliable choice for users that want a waterproof metal detector. Brands in the waterproof metal detector category are strong performers when submersed. They are made to have the most advantages when searching for objects on the beach, lakes, ocean and or other areas with water. There are a lot of low priced products in this category, which is a big difference from the professional category that has mostly high priced models. Variety in the brands is also big in this category, and you’ll find a lot of new and old names that don’t pop up in other lists. Zaap is one of those small names that pops up, and their product is a surprising value worthy of a purchase. Waterproof metal detectors have a lot more to offer than their ability to be used in wet areas. Some of these features are even favored by professionals. Waterproof Stem – Not only is the search coil waterproof, but so is the stem. Adjustable stems let you extend your range in wet areas to find more treasure. Low Price – Most of the products in this category have a low price tag. Even if you choose a starter kit, the price of the kit is still lower than other models. Freshwater& Saltwater Usage – Waterproof metal detectors can go in both types of water without getting damaged. It’s still important to check for saltwater usage, since some models don’t support it. Weather Resistance – Waterproof models are naturally strong in rainy weather. Advanced models also incorporate other weatherproof features to round out the durability of the product. Battery Backup – Users that are tired of having to swap out batteries while searching can rest easy with the battery backup feature. It stores an unused extra battery in the device and activates it when the original loses power. Some models keep the coil wire enclosed within the stem (Zaap) while others have the coil visibly wrapping around the stem. There is no danger in the coil wire being exposed, with plenty of those types being fully submersible. Other than the coil look, there are not a lot of big differences in the designs. Some color variations will pop up, but nothing that stands out from the average metal detector. The control panel is where a lot of the differences are seen, since there is a mixture of LCD and traditional meter layouts. As a result the control panels for both types are a lot less cluttered than other metal detectors. What Should You Look For In A Waterproof Metal Detector? Plenty of up to date features define the many pros of owning a waterproof metal detector. With all of the choices available, things can get confusing when making a purchase. Here are a few of the features that should be prioritized when buying a waterproof metal detector. Water Depth – Find out how deep the product can go in the water. It’s also important to note if the stem is submersible. The deeper the metal detector can go in the water, then the better chance you have of searching hard to reach areas. Audio Support – Models that have support for enhanced audio are better equipped to handle wet conditions. Even two tone audio is an improvement over the default, with or without the use of headphones. Water Type Support – Saltwater support is not always handled by waterproof metal detectors. Having support for it is a big plus and keeps you from damaging the product. Using an unsupported metal detector in saltwater will damage it or give you false readings. The importance of starter sets is sometimes underplayed for water metal detectors. Any set with a pinpointer, headphones or multi-function shovel will put you in a much better starting position (if you don’t have any of those materials). Headphones in particular are needed when working in water areas due to the amount of activity. Even if the set doesn’t come with headphones, it will more than likely have support for enhanced audio. This is important not only for detection, but also for discrimination functions. Any included pinpointer is useful and will go a long way in saving you time while searching in water. Locking systems for waterproof metal detectors play a role in keeping the stem stable. If the stem is submersible, then it is doubly important that the locking system is strong enough to keep the entire system together. A bad lock will throw off the balance of the metal detector, leading to false readings. In a worst case scenario, a strong current could knock the stem apart from the coil. Garret is a nice choice with their Camlock feature for all of the major series. They even sell it separately in case you want a backup. This is unique to Garrett, so buyers may want to take that into consideration when making a buying decision. Balance – Metal detectors that don’t balance out their weight will either be bottom heavy or top heavy. Bottom heavy means that the search coil is the heaviest part of the product. This will cause arm fatigue when using it for a couple of hours. Top heavy means the control panel is the bulk of the weight, which in turn will hurt your shoulder. Having a long stem is always preferred, but it needs to balance out the weight evenly across the metal detector. Locking System – It was discussed before how a locking system is an essential part of owning a metal detector. For devices with long stems, it is a must to have a competent locking system. The longer stem means that a metal detector is more prone to breakage and weight distribution issues. A locking system can ease the pains of these cons to a certain extent, and also save you the headache of needing to do a repair. Replacement Stems Are Rare – Lower durability from a longer stem needs to be taken into account if you prefer to do your own repairs. There are not a lot of brands that sell the part by itself, so if a particular model has a history of low quality stems, it is better to go with a shorter but proven stem length from a better model. Finding the right mix of quality and extras is a joy when shopping for waterproof metal detectors. The prices are low, and their accuracy underwater only adds to the value. Finding objects across the world is a lot easier with the help of a professional metal detector. Brands have contributed and offered rock solid choices with solo professionals and businesses in mind. With the improved features of these products, purchasing from the top tier has never been easier. The Timeranger is a familiar product from one of the better brands in the industry. It is available as a base unit or as a starter set, both at a high price. Four mode operation points to a basic setup, but after diving deep into the specifics of the control panel, it’s clear that there is much more to the customization. Automated functions like the ground balance and blanker system makes searching easy even in rough areas, while the programmable notch system is a welcome addition that was transferred over from their other successful lines. The coil is waterproof and eight inches, big enough to cover a large area without straining itself. The Timeranger is known for its low power usage, so the two 9 volt batteries it requires can last a really long time before needing a change. Target ID and depth readout is handled with the large LCD on the control panel, giving full access to all important information on a single screen. Total weight is only four pounds, and the length is adjustable to accommodate multiple heights. The last thing to mention is the blanker button that rejects unwanted objects so that you don’t have to linger in a single spot for too long. Using the Timeranger is recommended, with both the base and starter sets being a great value. 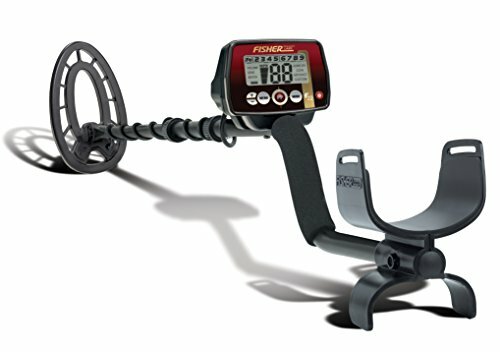 The high priced F22 has made multiple top ten lists for being a reliable metal detector for professionals. It can detect artifacts, coins, jewelry and more with its powerful 7.69 kHz operating frequency. Coil size is nine inches, which is more than enough to cover areas of any size. Only two AA batteries are required for operation, with adjustable sensitivity levels helping to stretch their usage out over a couple of months. And if it happens to rain in an area where you’re searching, the device is weatherproof by design. Materials used on the handle and control panel are solid, so the included five year warranty is rarely used. On the software side of the metal detector, four modes of operation is more than enough to handle even the most advanced tasks. Visual cues from the control panel include numerical target ID and a 9 segment visual. With static pinpoint, there is a lot of information on the screen at once- but this is a good thing. Memory settings survive with each battery change, so after customizing the F22 the way you want, it will always function that way no matter how long it is turned off. Numerical values on the LCD display is large, so even with bad eyesight consumers will be able to see the most important visuals. Operational weight is only 2.3 pounds, making it one of the lightest in the industry. The F22 is a solid choice when you want a device that can handle a lot of information. As one of the most expensive starter sets in the industry, the Garret AT Pro Digger’s Special is the kind of product that only a select few use. This is more to do with the complexity of the set rather than the price, and shows off a value that is hard to beat. Buyers are most likely already familiar with the AT pro series, with its high accuracy and advanced customization options. The control panel was revolutionary at the time it was created, with so many modes that only professionals could make the most of it. So other than the AT Pro, what else comes in the package? 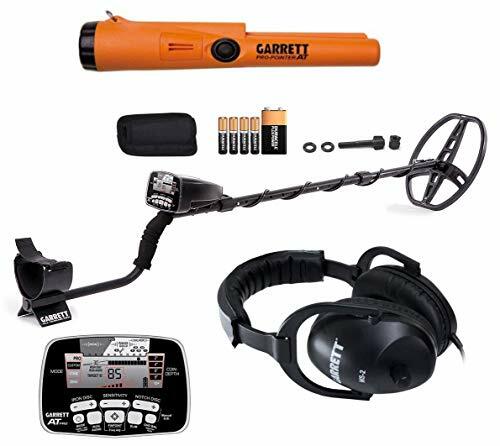 A lot of Garrett themed extras is included, most notably the Garret Edge Digger with sheath and the Premium Garett Land Headphones. Both are the best available types in their category from the company, so it is a good deal before you even get to the other products. An 8.5×11 coil cover is included, along with a camo digger’s pouch, AT Pro cap, digital camo soft case and four AA batteries. There aren’t a lot of starter sets with this much attention to detail, so the company deserves credit for putting this package together. It’s still an incredible deal and one of the few starter kits that professionals can depend on. One of the more high powered metal detectors is the Ace 400 from Garrett. It’s made for professionals and has one of the most pleasing designs for its category. The black/yellow look makes it suitable for a lot of setups, but it’s the load of options that keep its users coming back for more. Pulse-width modulation is the digital signal it uses for the tones, so they sound clear and crisp even when you’re in a loud area. Electronic pinpointing helps with finding materials, with the five search modes containing various filters and sub options. Depth adjustments will help you get to objects that are buried deeper than normal. The Ace 400 is built to withstand a lot of the normal interference that would bother lesser metal detectors. When you’re in an area where things are hard to detect, the automated functions will usually do the job. If there is still trouble locating an object, consumers can set the device up to use any of its eight sensitivity settings. Although most of the product is made of plastic, it still has an above average weight. Even with the high price of the Ace 400, it’s leagues better than a lot of the competition. Starter kit king Garrett does it again with another one of their popular AT Pro packages. This one is high priced but the difference is the extras that they included. There is also a difference in design choice, and they went from the black/yellow look to an understated black/gray. Since this is the all-terrain model, the design fits perfectly and won’t make the user stand out like a sore thumb. The coil is the standard 8.5×11 with a waterproof housing for wet environments. You can submerge it a maximum of a 10 foot depth, which is more than enough to reach a lot of important areas. Extras bundled with the package are an instructional DVD, Pro Pointer II and a power set of headphones. The biggest deal out of that package is the instructional DVD, which makes this professional metal detector accessible to beginners. It’s definitely worth a look if you want a high tier metal detector but have never owned one. For professionals, most of the DVD instructions can be skipped unless they’re interested in learning about the advanced functions like Pro Mode Audio or the forty levels of iron discrimination. 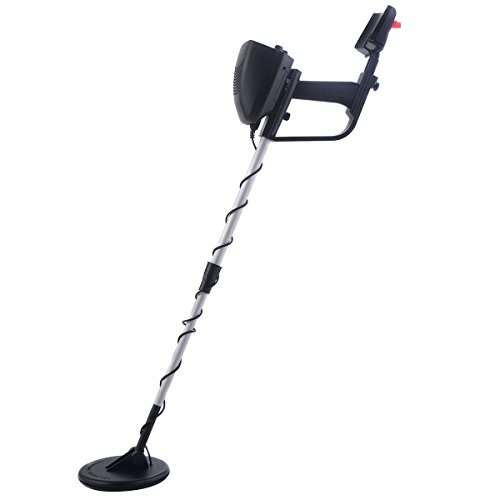 Customers of all levels can enjoy the very best this metal detector has to offer without making any compromises on uses. Being a limited edition isn’t the only reason this is a high priced product. The Teknetics T2 combines light weight and efficiency to become an incredible choice for all around performance. Reaching a lower maximum depth is possible with the exclusive boost mode, which was refined from the ground up to be even better than its last iteration. There are 5 inch and 11 inch search coils in one box, and it was the perfect way to get the best of both worlds. Users can now choose a coil based on their personal preference rather than being stuck with one. Having your target getting cluttered with objects you don’t want can be easily dismissed with the instant ground cancellation via the fastgrab trigger. But even with a lot of unidentified materials afoot, the bar readout is so clear that professionals will have no trouble deciphering useful information. With four AA batteries users can get over forty hours out of the unit. Total modes (including the multi-modes) won’t be handicapped, meaning that automatic ground cancellation is available no matter what personal customizations or filters you have in place. The five year warranty seals a deal that was already considered to be tops in the entire industry. Where available, the T2 Special Edition is worth the asking price. With underwater exploration in mind, this high priced starter set from Garrett is in a league of its own. The submersible 8.5×11 searchcoil is one of the many benefits of that helps professionals in water specific search situations. Premium stereo headphones are included with the package, useful for hearing important tones or keeping outside sounds to a minimum. But the start of the package is the Garrett Pro-Pointer AT underwater pinpointer. It’s the best type offered by Garrett, and it comes with a holster, battery and separate warranty. When you consider the metal detector comes with its own two year warranty, the entire package begins to look like a good deal. If this version looks familiar then you probably saw it on the television show Diggers. It’s durable, and waterproof up to ten feet. Users can cycle through standard or professional modes depending on their experience level. These search modes come with enhanced audio features, so it is important to note that this metal detector is at its best when using the supplied headphones. Three separate audio modes (Pro Mode, Proportional and Tone Roll) provide the best way to find a target without always having to reference the main screen. And if you’re a user that likes a lot of information, the 0-99 target ID scale will perform as expected. 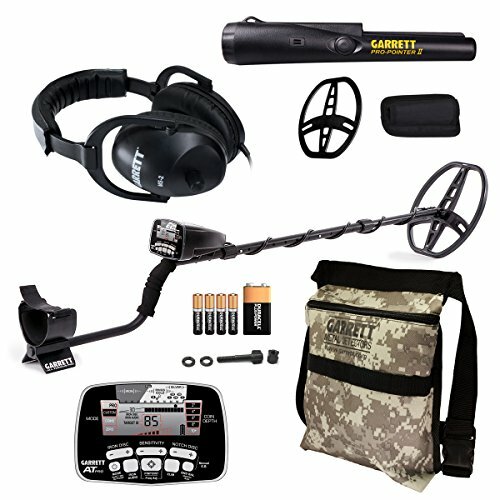 This is a big winner from the Garrett brand, and exactly what professionals want when they buy metal detectors. While Garrett is a dominant brand on the list, Bounty Hunter, Fisher and Teknetics are right there with them. The brilliance of Garrett comes from their starter sets, so it is all about the complete package. Brands like Teknetics are focused on improving their flagship models like the T2. The Special Edition of the T2 is considered to be a top five metal detector among professionals. It gets the job done and has very little weaknesses once you set it up properly. That can also be said about all of the brands when it comes to customization. In order to be listed as a professional metal detector, they need to have a lot of personalization options beyond simple filtering. Professional metal detectors have an incredible set of enhanced features that goes beyond the scope of normal consumer products. A lot of these advanced options require knowledge to use, but a good amount of the perks are just beefed up hardware specifications. Multiple coils – Having access to multiple coils is useful for different areas. For other users it is just a personal preference that is nice to have. Double Filter Discrimination–Filters can be set up to interact with one another so that finding specific targets is easier. This is beneficial in areas where there are a lot of metals. Deeper Depth – Professional metal detectors have a deeper depth than consumer grade models. Objects that would normally be out of reach will now be detected when the right options are selected. Enhanced Ground Cancellation – Just like double filter discrimination, ground cancellation can be used with multiple modes. This locks you into your target and makes it easier to dismiss unwanted objects. Better Warranties – With better guarantees on their warranties, professional metal detectors are a smarter buy. Users will get speedy service no matter which brand they go with. Weather Resistance – Bad weather throws off readings even on good terrain. To get around this, professional metal detectors are equipped from the ground up to handle harsh conditions. Highest Frequencies – The products in this category are set up to have the highest frequency available when looking for precious metals. Even if you don’t set up the filters, a professional metal detector is more accurate out of the box than consumer metal detectors. Having a pinpoint setting is different than having an actual pinpointer. Professional metal detectors that come with pinpointers take full advantage of its ability to detect metal in holes. When you’re digging for a specific object, damaging it is a concern. Using a pinpointer before digging a deep hole will save you time if the metal is of no use. And if it is something you really want, a pinpointer will keep you from damaging it while digging. Remember, a metal detector finds metal objects within the coils circle and up to 10 feet deep. There is a lot of guesswork involved before you start digging, and that is why pinpointers exist so that guesswork is kept to a minimum. What’s So Special About Professional Metal Detectors? Three things; accuracy, customization and build quality. The combination of these three features separate a professional metal detector from the rest of the pack. Accuracy – Searching with a metal detector that has high accuracy helps out when you’re in an area with a lot of materials. It also cuts down on natural and manmade electronics/magnetic interference. This is important whether you’re doing land or water based searching. Customization – Filters and memory profiles are the bread and butter of professional metal detectors. The often complicated information that shows up on the LCD will only show what you’re most interested in. While there are a lot of automated features built into all metal detectors, it’s professional metal detectors that allow you to fully control the impact of these functions. Build Quality – Not only are the components built better, but they’re higher quality. Having a higher build quality is nice but it doesn’t make a product better by default. Having a high build quality and pairing it with accuracy and customization is what makes a professional metal detector stand out. Can An Average Consumer Use Professional Metal Detectors? Yes, which is far more likely if they choose a Garrett starter set. With this brand consumers will get a great instruction manual, and in some cases an instructional DVD. Neither one of these guarantees that a consumer will be able to handle the advanced functions of a professional metal detector. A certain level of experience is required to reap the benefits of any of these high priced products. So the only reason for a consumer to consider professional metal detectors is if they require a higher level of accuracy and customization. How quickly consumers catch on to the extra features will be determined on a person by person basis. Professional metal detectors are equipped with the latest technology needed to boost accuracy. With a little bit of patience, even normal consumers can enjoy the extra benefits of owning these beefed up products. And for professionals, they get a metal detector that has no other equal. Handheld metal detectors are light weight and portable devices. These devices can be held in the hand comfortably. They are employed in various places for detection of metal targets in items that people might be carrying such as handbags or even pockets of various clothing but security metal detectors are better for that function of you want the best. They are used for personal and public reasons and they are potent detectors of dangerous metal items due to their ability to explore metals of different kinds albeit in a small area. If you want to be sure of the safety of the items you are working with these devices can come in handy. You can create a safe environment by employing the handheld metal detectors to inspect mostly recycled items that could be harboring dangerous sharp metallic items. The places where these devices could be quite appropriate include exhibition rooms, prisons, workshops, factories and railway stations just to name a few. 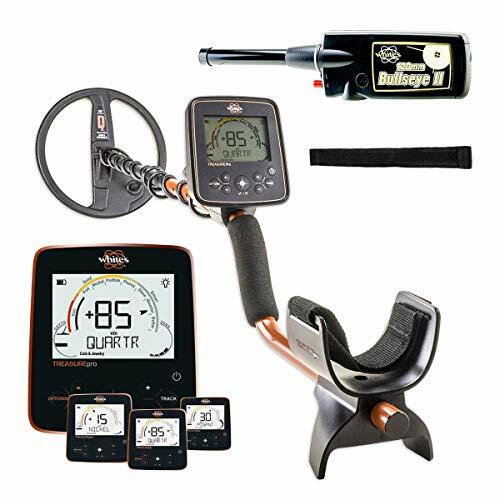 This detector is the most powerful metal detector that is designed for wood workers. It provides accurate precision on metals in any kind of lumber especially the recycled kind. Some of these metals include: steel, stainless steel, zinc, magnesium and aluminum. This implies that it can detect nails, screws, wires and even bullets. These metals could actually damage the planer, blades and jointer. Weighing only 13Oz, the device detects any metal that could be lying on or inside wood up to a depth of 6 inches. This is possible by means of the automatic tuning circuitry at operating frequencies of either 13 kHz or 6,600 Hz. It requires one 9V battery to function. The wizard usually indicates low battery by changing tone to a warble and using the flashing light as opposed to a steady tone and light when a metal is detected. If it drops any further to below 5V, a constant beep tone. The standard battery life is 80 hours. It has adjustable sensitivity through an access hole in the handle for convenience and increased detection. It has an on/off switch button with a stay-on functionality. This is the latest flagship product from Wizard Inc. The device provides the best possible precision for the detection of metal inside wood. This is especially important in avoiding or preventing damage to the blades and such like parts by nails or other pieces of metal found in recycled wood. This is not to say the device cannot be used on new lumber. It has a 6 inch coil and the little wizard has a 2-inch one. Like its predecessor, it operates on automatic tuning receive/transmit tuning at dual frequencies of 13 kHz and 6,600 Hz. The device is advertised as having better false-positive rejection and use by single-hand when compared with earlier models. It also has the option of vibration alert for noisy workshops and a piezo tone or beep alert for quiet ones. Aside from these two switches, there are three others: the on/off ones, laser indicator and the fine tuning adjustment screw. The device has an earphone jack for addition of headphones if one would wish to have them. This model has laser line generation which shows the location of detected metal using laser technology as an option. With each new installment by Wizard®, there has been a buzz and this one is no different. It has delivered and awed in equal measure. The device can scan any type or size of wood regardless of its moisture content. In spite of these wonderful specifications, the Lumber Wizard 4 cannot be used or stored carelessly and by this I mean in temperatures below 40 degrees or in a damp, humid or moist environment indoors. It uses the 6 inch wide scanning area to deliver the good results and is made up of a well-finished, sturdy plastic casing. The device comes with a one year warranty on parts. All it requires for start-up is one 9V alkaline battery which could have you using it for about 30 hours. 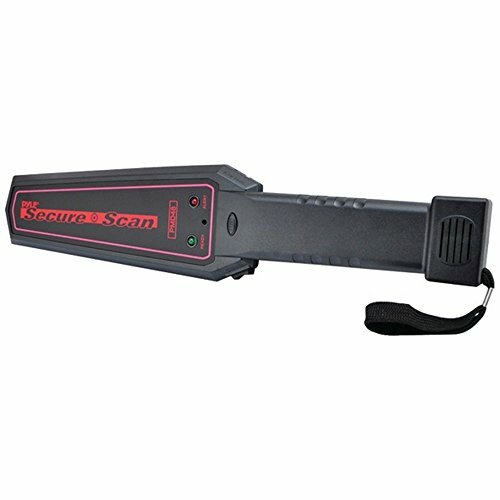 This handheld metal detector enjoys quite some popularity and is considered as the best in the market. It stands out among the security wands and is quite versatile and it can be used in various situations. 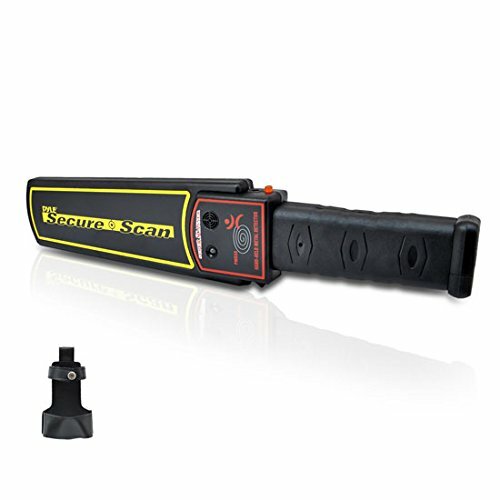 You could conveniently use it for searching for metal studs embedded in walls and what is more is that you can also search for target in low light conditions due to the flashlight feature of this handheld metal detector. It is additionally waterproof and its make can be said to be sturdy. 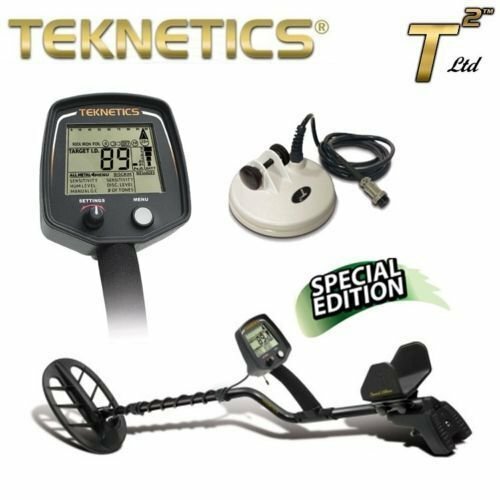 Since most of the people desire for the best results from a handheld metal detector this is one you definitely want to have your hand on. The price is handheld but it is worth every dime you will spend. This device has a plastic finish to make it light weight for portability. It features adjustable sensitivity which boosts accuracy and precision during hunting. It also has tone settings which can be altered with vibrate settings. This is especially useful when wishing not to be the source of noise around your environment. It is quite small in size and that makes it useful for hobbies and security check detection at public places such as banks and airports. It is advertised for miscellaneous use which implies that it can also be used around the house for fun. It actually weighs 9.6Oz. It requires two 9V batteries to function and these are not inclusive of the purchase. Users determine the device as the best buy for value for money. Handheld devices metal detectors are light weight and portable devices. Metal detector refers to devices that could help you locate and find material made from the various types of metals. he control box will provide room for the internal circuitry, the batteries, the microprocessor as well as the speakers. The shaft will act as part which connects the search coil to the control box while the stabilizer will help in maintaining stability of the device while in use. Due to the small size of the handheld metal detector some components such as a long shaft and the stabilizer had to be eliminated. 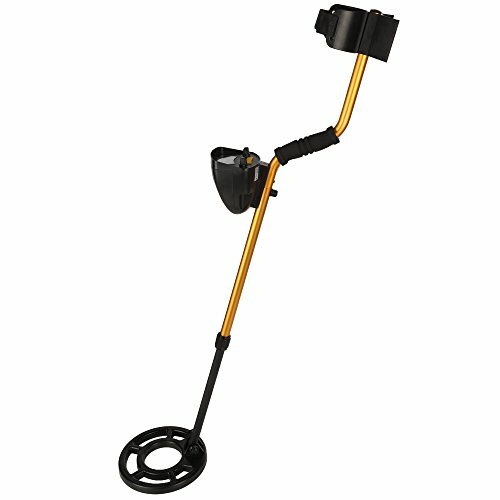 Where to Use a Handheld Metal Detector? The handheld metal detectors are employed in various places for detection of metal targets in items that people might be carrying around such as handbags and even in the pockets of various clothing. They are used for personal and public reasons and they are potent detectors of dangerous metal items due to their ability to explore metals of different kinds albeit in a small area. Using these devices is not a hard task though it need some practice. All you have to do is turn on the device and sweep it along the surface with the potential metal target, where you desire to explore with the help of your metal detector. The device will then alert you using the available response options in the presence of a metallic target. Make sure not to confuse handheld metal detector with a security detector or metal detector pinpointer. If you want to be sure of the safety of the items you are working with these devices can come in handy. You can create a safe environment by employing the handheld metal detectors to inspect mostly recycled items that could be harboring dangerous sharp metallic items. For instance someone who is recycling old furniture the use of these handheld metal detectors could help them pick up metallic objects that could be embedded in the furniture. The places where these devices could also be quite appropriate include exhibition rooms, prisons, workshops, factories and railway stations just to name a few. In constructions where metals have to be searched in wall frames a large metal detector has to be used after which a handheld metal detector is employed in the localized area. The size of these devices makes them suitable for use as security wands which can be used in concerts and in the screening of people who may be accessing places like schools or city buildings. Those to be used for security need to be the best of them all as no stone should be left unturned in such matters. For a metal detector to be considered as the best it has to have certain unique features that increase its potency. The design has to be sturdy and the price should be fair enough for most to consider it. The suitability of a handheld detector will also be determined with the place where it has to be used. The location will dictate which will be the best alarm response to be expected by the operator. The alarm responses could be audio, visual or it could be a vibration. The vibration response will be the most suitable for use in places which are noisy such a concert or when used by security agents to give them time to react as the suspect will be oblivious to this. Those which come with headphones will also be quite appropriate. In places with low light conditions it would be best to use handheld metal detectors that come with a flashlight to increase the visibility while exploring. Finding a handheld metal detector with waterproof case will be quite convenient for use in places that are near water or in water hunting. A waterproof and sturdy design could increase the life span of a metal detector as it will be best for withstanding various weather conditions. Metal detector come in different types that is the beat-frequency oscillation type, the Pulse induction variety and the Very low frequency type. All these have their ups and downs depending on the location of use. 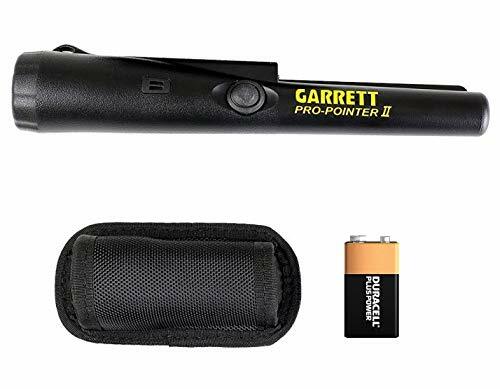 The Garrett Pro-pointer is considered as the best handheld metal detector and it can be used in any setting. The flashlight in it will help one search for items in areas with low light and the design is waterproof and sturdy. It costs much but it can prove to be worth every penny that you will spend. If you cannot get your hands on this handheld metal detector you could consider the other ones that have been briefly discussed earlier on in this article. 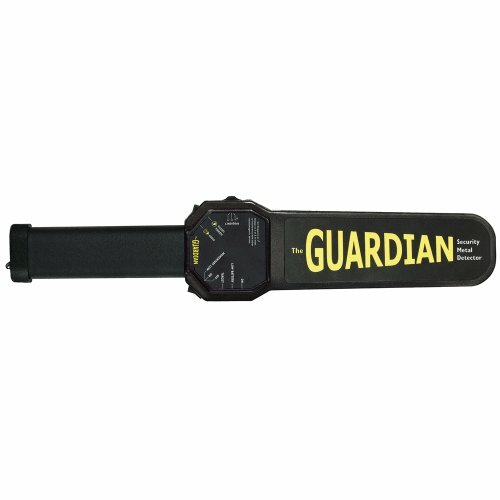 In conclusion handheld metal detectors are small and portable metal detectors which are used to pinpoint the location of target metals in small areas. They can be used to augment large metal detector in situation which require a precise location of the metal target. It is recommended that you select the best handheld metal detector depending on the needs. Various features have to be inspected as outlined above and the presence of additionally features such as flashlights and all the alert options should make one have an edge over the others. You should only settle for the best handheld metal detector to guarantee on quality finish and the desired efficiency.